"A simple and guilt-free breakfast. Tapioca flour gives these pancakes elasticity and applesauce combined with a bit of cinnamon give them a pleasant, homey aroma. Serve drizzled with honey and lemon juice or another sauce of your choice. Delicious, paleo and gluten-free." Whisk eggs lightly in a large bowl. Add applesauce and vanilla extract; mix to combine. Combine almond flour, tapioca flour, cinnamon, baking soda, and salt in a separate bowl. Add to egg mixture; mix until just combined. Add water until batter is desired thickness. Set batter aside to rest for 15 minutes. Melt coconut oil on a griddle over medium-high heat. Drop batter by large spoonfuls onto the griddle and cook until bubbles form and the edges are dry, 3 to 4 minutes. Flip and cook until browned on the other side, 2 to 3 minutes. Repeat with remaining batter. You may want to substitute baking powder for baking soda if you're not 100% paleo. You can add more or less water than the recipe calls for, depending on how thick or thin you want your pancakes to be. I am addicted to these pancakes! I use a combination of almond flour and coconut flour instead of the all-almond flour component, and they are not too grainy/nutty then. 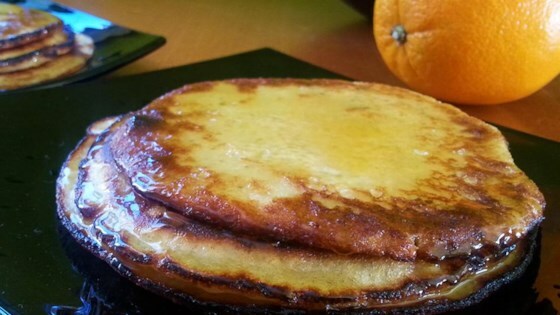 Great consistency, very much like regular pancakes. I added our usual chopped walnuts and blueberries to the recipe, and it came out tasting like our wheat based pancakes.